Antiques and collectibles searches on Kovels.com are often due to news of a new trend, an interesting collection, a record price, or an amazing find that sends collectors off to do research. Pottery, porcelain, glass, and metals like silver, pewter, brass and copper are always popular with collectors and frequently searched. Here are the 10 most searched-for antiques and collectibles categories on Kovels.com in 2018. Kovels’ list of top searches reflects items that readers have and want to identify and value, as well as what their mothers and grandmothers owned. It brings to mind current words like reduce, reuse, recycle and repurpose. 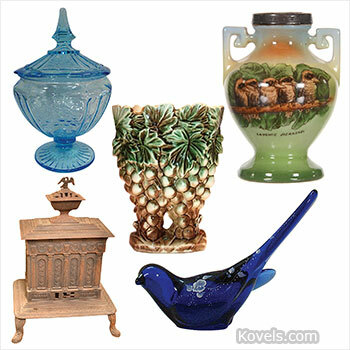 Collectors who use Kovels.com can learn not only prices of antiques and collectibles, but also identifying features, marks and makers’ histories. Find 20,000 new prices and 2,500 new pictures, added just this month to Kovels’ online price guide. And even more prices and pictures are in our latest book, Kovels’ Antiques & Collectibles Price Guide 2019, available from Kovels.com online store and local bookstores.